Hey, what do I look like, her sensei?! Heh heh, you're cute when you get angry Knuckles? 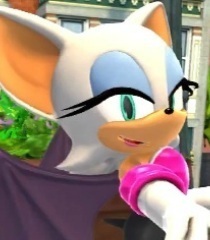 (finds Dr Light in his imprisonment capsule) You can call me Rouge. I'm a spy and, right now, your best friend. (Angry; coughing cause she just got out of Chaos Devil, a water creature) *cough* I'm always up for ruining your fun. *cough* But you made it personal when you took my teammate, Shadow. (Slightly fatigued, having been rescued by Mega Man) Oof ... nice shot. I guess I owe you one. Thanks buddy! That thing that snatched me was like nothing I've ever seen before. Thanks, Big Blue! That's the first time I've ever been stolen. Because my make-up took forever and I had a few adjustments to do to my costume.